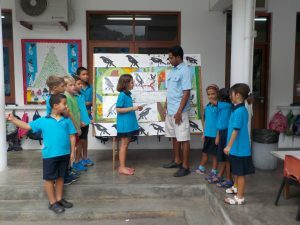 The Wildlife club raised funds to help the recovery programme for the Seychelles Magpie Robin. This endangered bird captured the hearts of our young naturalists and they organised a Bring and buy Sale at the school. Children brought items to sell and bargained hard with their young customers to sell at top prices the books and games they had donated. The club were delighted to find they had raised over 3000 rupees and the money will be used on Aride island to make new nest boxes. Island Conservation Society accepted the cheque gratefully. The Wildlife club hope to visit the birds one day and see them in person!